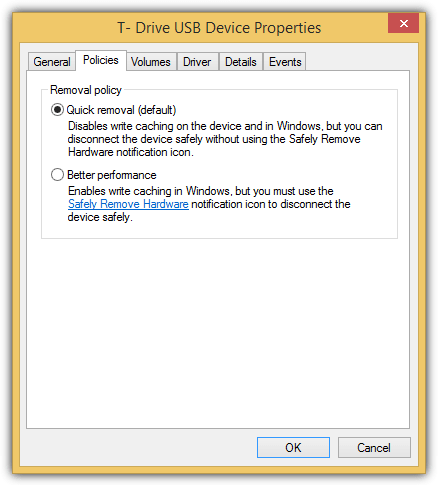 There are 2 drive removal policies in Windows which are quick removal for convenience or better performance for speed. By default the “Quick Removal” policy is selected to disable the write caching on the device so that you can conveniently unplug the USB flash drive without the need to eject the drive from Safely Remove Hardware. Even though the quick removal policy is enabled, you should always try to use the safely remove hardware icon whenever you can because there is always a risk of data corruption. If you’ve closed all visible programs that are attached to the USB flash drive but you’re still unable to safely eject, here we have 5 tools that are able to show the hidden locked files on the USB mass storage device and give you the options to unlock, delete or move the file. 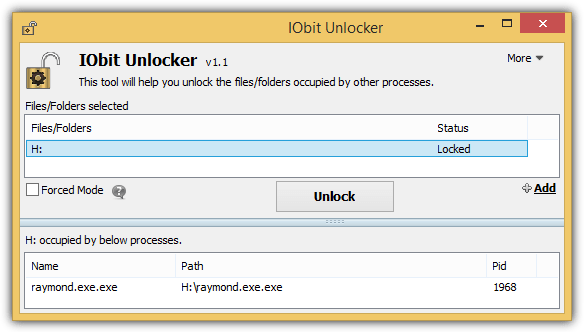 IObit Unlocker is one of the most powerful if not the most powerful tool to forcefully delete a locked file. In one of our tests, IObit Unlocker is the only application in its class capable of deleting a protected file belonging to an antivirus software in real time while the others failed or require a Windows reboot to complete the process. To check what process or file that is locked to your USB flash drive using IObit Unlocker, you can either right click on the USB drive letter and select IObit Unlocker from the context menu, or run the program, click the Add button and select the drive letter. You can try clicking the Unlock button to release the locked files and if that fails, there is a forced mode to terminate all related processes. Interestingly the portable version of IObit Unlocker released by PortableApps didn’t detect the locked files on my USB flash drive while the installed version did. 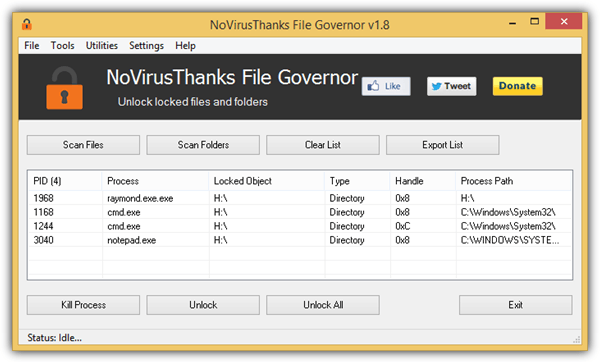 File Governor is a free file/folder unlocking tool created by NoVirusThanks. Although it looks like you can only scan for locked files or folders, you can actually scan the drives by selecting the drive letter from the Scan Folders option. You can kill and unlock the process from the given buttons and also delete or rename from the Tools menubar. The installation version of File Governor automatically adds a right click context menu which only shows up on files and folders but not on drive letters in Windows Explorer. If you don’t need the context menu, an official portable version is available to download and use. 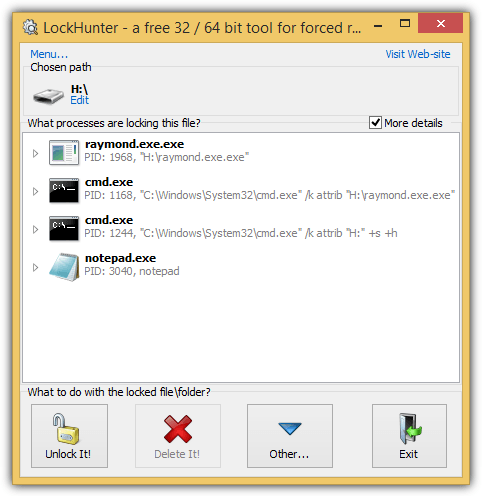 LockHunter is a free software created by the same company as the shareware USB Safely Remove. Similar to other tools mentioned above, LockHunter is used to show the processes locking a file or folder and giving you the options to unlock, delete, rename, copy and terminate the locked file. A right click context menu “What is locking this folder/file?” is added after installing the program and there’s no option in the program to disable it. A pretty useful feature in LockHunter is enabling the “More details” checkbox which shows the process ID (PID) and also the full command line of the locked files. EMCO Software is a company that is well known for their networking products such as Network Inventory, Auditing and Remote Deployment. They’ve created a free EMCO UnLock IT software to unlock a locked file or folder. 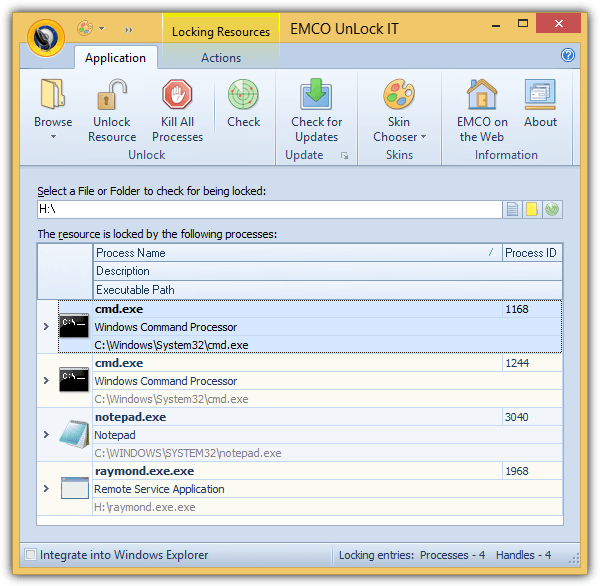 Unlike other unlocker tools, EMCO UnLock IT’s graphical user interface is very modern with ribbon menus and even a skin chooser that allows you to change the theme of the GUI. By default UnLock IT does not add a right click context menu and you can manually add it by checking the box “Integrate into Windows Explorer” located at the bottom left of the program. It is only possible to unlock resources by closing the handles or killing the process but you won’t find the option to delete the file. If you need to delete a file, they recommend another one of their free tool called MoveOnBoot. Other than the standard features that you’d normally find in an unlocker software such as scanning files, folders and drives for locked files and giving you the options to unlock, kill, delete, rename, copy or move, Free File Unlocker has a unique feature where you can specify a list of paths to files or directories for mass unlocking. Other than that, you can switch the language of the GUI to 38 different languages. Do take note that during installation, there will be a step asking you to click on the Accept button to continue installing 4Dots Software and there is only an accept button. It is actually an adware so make sure you click on the X button at the top right to decline the installation of the adware. If you have 7-Zip, other supported archiver or universal extractor, you can extract the setup file and run the portable FreeFileUnlocker.exe program which bypasses the tricky adware. Additional Notes: One of the main causes of a USB mass storage device being unable to eject is due to an active persistent piece of malware that is attempting to spread via the USB flash drive. If it’s really due to a malware, most of the time the unlocking process would fail or the drive would instantly be locked again after unlocking the locked files. What you should do is use an antivirus to scan and remove any detected viruses from your computer and the USB flash drive. My external USB drive is one of those Seagate hard drives that constantly goes into a hibernation/sleep mode. (It delays the whole OS for 5 or 6 seconds until it leaves that state to start up. For that reason, I only use it for storage.) While in that mode, if I try to eject it, i get the “This device is currently in use…” error message. However, after I cause it to leave sleep mode, and start up–by clicking on its icon in Windows Explorer–then I can eject it no problem. Hence, in my case, the USB Seagate hard drive’s hibernation/sleep state was the cause of the problem, not any running app process. I always open the task manager and look through what’s running. If there’s a program open related to the programs on my USB, I close that and it usually solves the problem. For example, when I use Word, Office continues to run in the background. I have to got to task manager to close it so I can remove my USB. It’s an easy quick fix, but if anyone knows of a more permanent solution that doesn’t involve downloading any external tools, I’d appreciate it! It is usually a program that you used to open files on the flash drive. I find that one of the biggest offenders is file explorer. So usually if you cannot find a obvious program that is using the file like a word processor or database program that you use to open a file then close file explorer and that is usually the culprit. Of course most of these unlock program should work but if you don’t have one then try closing file explorer. If you have a program like process explorer you can use the search handle function by looking for the drive letter that was assigned when you plugged it in the USB ( ie E: ). If it find it then you can just close the handle and that has worked for me also. This is certainly excellent cool. I’ve been looking through the bunch on-line and also really preferred this adaptation. Thanks to the italian guy. It worked!! I was having trouble ejecting my Transcend StoreJet 25M portable HDD on the very 1st day I had purchased it. But, thanks to you, my drive was ejected in seconds! Fantastic. Problem has been resolved with Unlocker.